Behaviour prior to the show – Judges should be conversant with the timetable of events, number of classes and championship awards. They should not look around the sheep lines, view a catalogue nor speak to exhibitors. At very large shows e.g. Royal Shows, it would be preferable if the judge did not exhibit sheep or view large shows that come close to their main event. Mobile Telephones – Ensure that your mobile telephone does not ring during judging. If you are awaiting an urgent call then leave your mobile phone with the steward or someone outside the ring. Stewards – Good communications with your steward is essential. Hopefully they will be conversant with sheep and therefore of great assistance on the day. Meet with your steward for tea/coffee prior to judging and discuss with them the number of classes, prizes, timetable and any anticipated problems etc. Always be conversant with the prize list before starting; do your homework. If you have not been sent a prize list before the show make sure you obtain one (not a catalogue). Use you steward to direct the sheep. It is their responsibility to check that the correct category sheep are put before you in each class. Inform them of any requirements you may have i.e. ensure gates are available for letting sheep run loose. Study the judging ring before you commence judging, if there is an incline always ask the steward to face the sheep up the hill. Always watch the sheep as they enter the ring, a great deal can be learnt from first impressions, before exhibitors have had the opportunity to position the sheep. Study the sheep well when they are lined up, do not be in a hurry to handle them. Walk along the line, back and front and make a mental note of sheep that appeal to you. Remember the spectators, always give them a good view of the sheep and if necessary alter the way the sheep face for the second line up. Do not crowd the sheep up to the fence. How quick should you be, how do you cope with very large classes of sheep, should you always handle every sheep? a) Handle all sheep as a courtesy to the exhibitors and move sheep forward that you like, as you find them. Place sheep as you find them so that you do not have to handle sheep more than once. Be aware of the time scale, don’t waste time but be consistent and thorough. b) Unnecessary to handle all sheep to this degree if the classes are very large. Your visual assessment will enable you to decide upon a short draw. These sheep should be moved forward. Those left behind should be handled before asking the steward to remove them from the ring. Then the systematic handling should take place. How do you handle sheep, which parts of the anatomy do you check and assess? Follow a set routine when handling the sheep, this will ensure that you check everything on all animals. Check all points including teeth, testicles, udders and pasterns. Do not handle loins too roughly. Check behind shoulders and between front legs for over fit sheep. Run your hand up and down the brisket to check if any white wool has been removed/masked. Split the fleece on the side to check length. A good idea is to line up all the sheep facing lengthways so that comparative length and body depth can be assessed. This also gives the spectators a good view of the sheep. 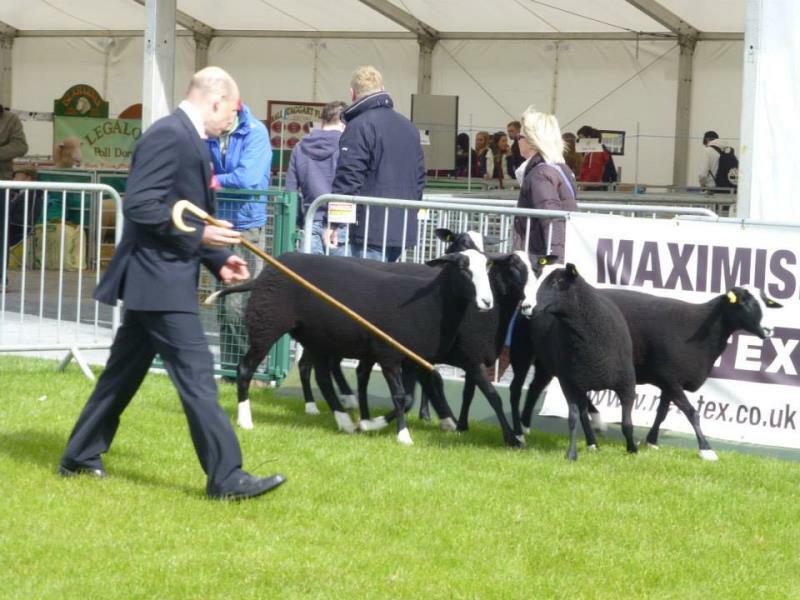 Be aware of the breed standard with regard to markings and if at a Royal or County Show be prepared to place any sheep not conforming to the breed standard at the bottom of the line. If judges discover an animal with an infectious disease such as orf, ringworm, caseous lymphadenitis then they should request the steward to have that animal returned to its pen. This should be done with as little fuss as possible. Try to include the animal with others that you do not wish for the short draw. Alternatively it should be placed at the side of the ring until the conclusion of the class. Letting sheep run loose is the best way to see them move naturally and therefore should be carried out. It is unnecessary to loose more that the top 8/10 sheep and only 4/5 should be let go at any one time. It is a good idea to loose one and then ask the next handler to loose his sheep so that the second animal runs to join the first one. This can be repeated and allows the judge to see each sheep move by itself. Beware with older rams and shearlings later in the season as they tend to fight or jump on each other and little can be seen. A stick should be carried at this stage to move sheep so that you can see feet and legs. It is very important to ensure the ring is secure before letting sheep loose. Showing animals led on a lead or collar may be normal on the continent but does not generally show the movement of the animal at its best. It may also end up with the animal being dragged around by the exhibitor which is of no use to judge or spectator. Remember that whilst you are judging the animal, spectators may also be interested in the animal commercially. What is your next step in arriving at your placing? Judges by this time should be arriving at their placing. Loosing sheep and turning them lengthways should all be tools to help you make up your mind. Use these techniques at the most helpful time in order to make decisions between animals. What do you do if all the sheep in the class are not really your choice? Judges must remember they are not there just to pick out an animal they would like – they have to give consideration to all the animals placed before them. Even if nothing is a real ‘topper’ they have to choose the animal they think is the best (albeit of a bad lot) and take it from there. You will find classes of very good sheep easier and more enjoyable to judge. Trimmed or untrimmed is acceptable. Be particularly aware with trimmed animals the potential to hide stray white markings within the wool. Only the first prize winners in each class should be brought into the ring. These should be lined up by the steward in class order. Second prize winners should be ready to bring forward should you require the second prize winner from the class that you have chosen your champion. Check with the steward what is required in the championship, whether there is an award for female and male or just champion and reserve champion. 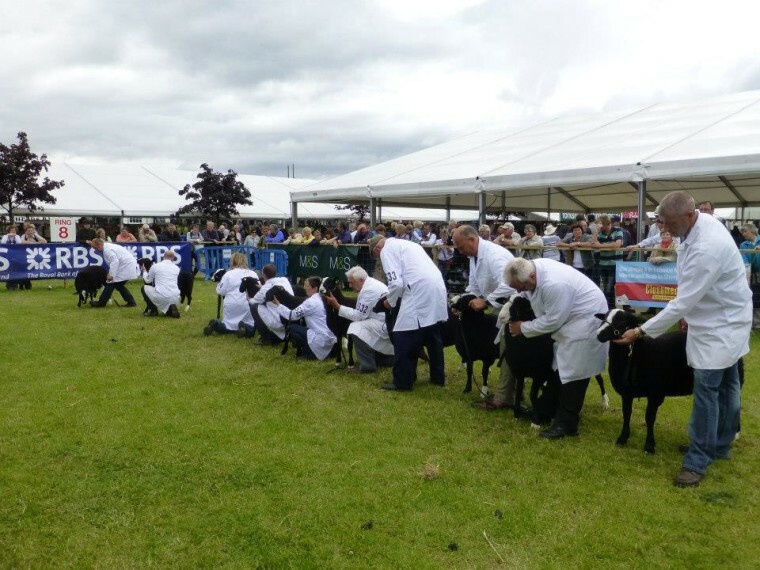 Make sure everyone around the show ring knows which sheep you have awarded the championship to; pull the sheep forward, lay your hand or stick on its back with a bit of a flourish. Always award the champion ticket first, then your reserve. Judges should consider the interbreed class when choosing their champion. A good strong sheep will always stand a better chance against other breeds. However, this should be the sheep you consider the best on the day. If sheep that you have bred are presented then these should be placed to one side and judged by an independent referee. It is the responsibility of the exhibitor to declare ownership to the steward. 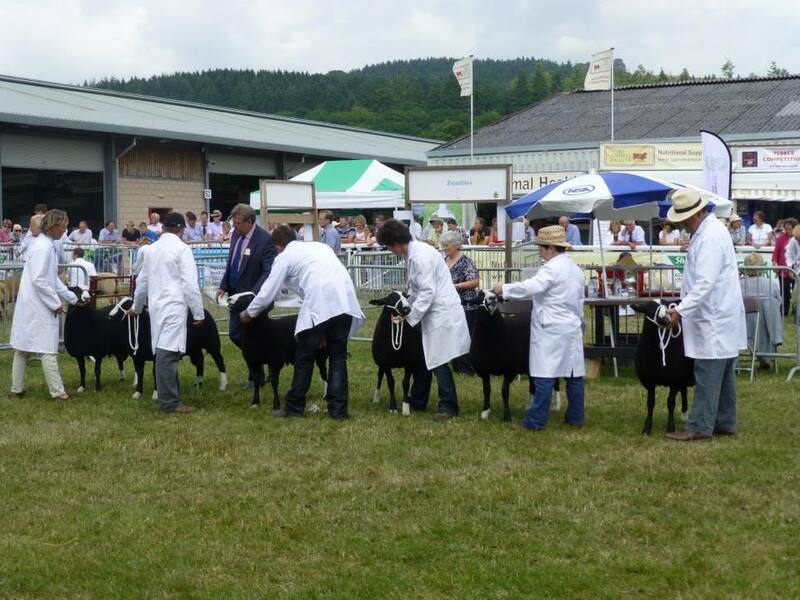 Most of the major shows have their own rules regarding the judging of sheep bred by the judge, be aware of these rules before you commence judging. You should judge the sheep put in front of you and not concern yourself with any breeding details. The rule of thumb should be “pleasantries during – commentaries afterwards”. Be courteous and say good morning but do not enter into conversation with exhibitors. If someone tries to tell you the life story of their sheep, ignore it and walk away. You may ask the birth date of lambs. Be available to discuss your placements after showing has finished. Some shows may ask for a ‘commentary’ style reasoning for placings at the end of a class. Judges should adopt the same routine and level of checking/handling at pre-sale show classes as for a county show. However, it is acceptable at the more commercial events for sheep to be presented in more natural conditions i.e. less trimming. Allowance for this should be made in the placings. Judges should select what they like and not try and interpret likely market demand.